A visit to Borneo isn’t complete without seeing its jungles and rainforests. Hearing a proboscis monkey’s distinctive call, discovering tropical flowers and plants, watching a stick insect scuttle across a path: you never know what you’ll find in the jungle. Day trips from Kota Kinabalu and Kuching can be arranged but to truly experience these incredible landscapes, staying a few nights in a lodge or chalet is worth the journey. Many lodges are in fairly remote areas so accommodation is simple but comfortable. Along the Kinabatangan River and in Southern Sabah, in-house guides lead daily walks, river cruises, or drives to look for wildlife. In most cases, guides lead guests in groups to minimize disturbance to the wildlife and eco-system and maximize your chance of seeing animals. While private guides can be arranged in certain circumstances, we encourage you to join in and meet your fellow holiday-makers. 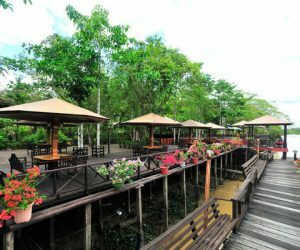 Next to the Sepilok Protected Forest Reserve, this small resort offers semi-detached chalets and a boardwalk with multiple viewing decks. Shuttle service is provided to the nearby Sepilok Orang Utan Rehabilitation Centre. Simple chalets in a garden setting within walking distance of the Sepilok Orang Utan Rehabilitation Centre. This jungle resort has both self-guided and guided nature walks available to guests. Located one hour from Sandakan along the Kinabatangan River near the village of Abai, this lodge offers the best chance in the area to see fireflies. A National Geographic Unique Lodge of the World set on the Kinabatangan River, this lovely lodge is the only one in the area with a swimming pool. It's an incredible place for wildlife viewing with expert guides, new luxurious villas, a spa, and an environmentally-friendly ethos. 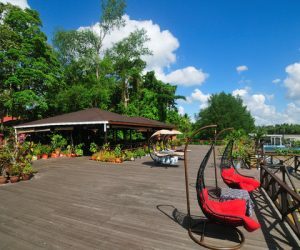 Near Sukau on the lower part of the Kinabatangan River, this lodge offers an opportunity to see endemic proboscis monkeys, orangutans, and other wildlife in their native habitat. A luxurious retreat deep within the Danum Valley Conservation Area with beautiful chalets, in-house guides, and access to the million-year-old primary rainforest. A more affordable option for seeing the ancient rainforest of Danum Valley, set on the outskirts along the Kawag River. Walking trails, a waterfall, and one of the most biodiverse areas of Sabah await guests at Kawag Danum. River and hillside lodges within the Tabin Wildlife Reserve. This rainforest is home to gibbons, orangutans, elusive clouded leopards, a staggering array of birds, a mud volcano and more. 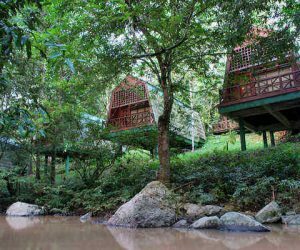 A lakeside resort near Batang Ai with a canopy walkway for beautiful views of the jungle and waterways. Inspired by traditional longhouse design, the Aiman makes an ideal base for learning about the Iban culture and history. 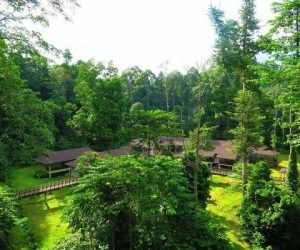 Basic lodging within the national park for those wishing to experience a night walk to look for frogs, civet cats, flying lemurs, and other nocturnal wildlife.